banner image: Jen "running" in 1975. 2014 Escarpment 30K Trail Run. 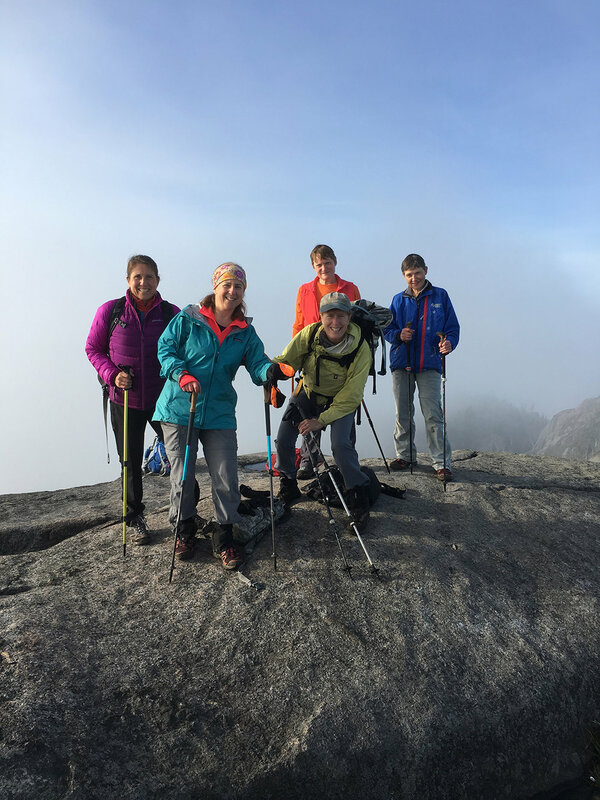 Jen has spent many weekends wandering the remote trails of the Adirondacks these past few years, and on October 6, 2018, she summited Phelps Mountain, her 46th peak, adding her name to an elite group of athletes and becoming an Adirondack 46’er. Her friends hiking with her watched as she received her coveted 46’er patch, after many hugs and high fives! Jen says, “I like being outside,” and credits her parents with instilling in her a love of the outdoors and nature as a child in Michigan and western New York. She recalls family nature walks and small hikes in local parks, and summer trips to Maine, where they’d be outside all day, thanks to no television. They also went on family trips to the zoo, sparking a love of animals that still exists today. Celebrating 46'er with hike leaders on Phelps, October 2018. Before she began hiking, Jen became an avid trail runner, helped in part by crossing paths at work with Laura Clark, a well-known trail runner and snowshoer. She encouraged Jen to give trail running a try, and after her first 5K trail race at the Wilton Wildlife Preserve & Park in the summer of 2009, she was hooked! She made it to all five races that summer, and then joined the Saratoga Stryders. This led to friendships with some seasoned female hikers, who took her to Goodnow Mountain for her first foray into the Adirondack woods. She climbed to the top of the fire tower, savoring the gorgeous fall foliage below. She credits these ladies with teaching her what to bring in her pack, including duct tape around your Nalgene bottle in case you need it if something breaks, extra socks, and two plastic bags to prevent wet, cold feet. These women then invited Jen to join them on their Wild Women Winter Weekends, and they hiked sections of the Northville-Placid Trail, and did overnights in Merck Forest in southern Vermont. These trips lit a spark in Jen, leading her to think she wanted to do more. Ampersand with Donna Olson, Jen, Maureen Roberts, Joan Ide and Karen Provencher, 2017. That “more” became her first High Peaks, Dix and Hough, in 2012, a hiking farewell party for two British runners who had been in the Stryder family for a few years. Jen asked if she could do it in trail runners, and was informed she needed to get a pair of boots! The hike was made more difficult due to blowdown from the recent Hurricane Irene, and Jen found it “intimidating.” There were no mishaps, the views were incredible, and she learned “what an Adirondack mile is.” The feeling of accomplishment stayed with her, and she joined the Adirondack Mountain Club six months later at the Adirondack Sports Expo in Saratoga. She had just gone on a work trip to Seattle all by herself, so she had no problems signing up to hike “solo” with ADK. She took the plunge in spring 2013, hiking the formidable Santanonis, fearful that she would not be able to keep up with the group, but finding out she was fine – in “the middle of the pack.” On this hike she crossed paths with Joe Babcock, a frequent ADK hike leader, and in time their friendship would grow and he would be present on many of her future hikes! 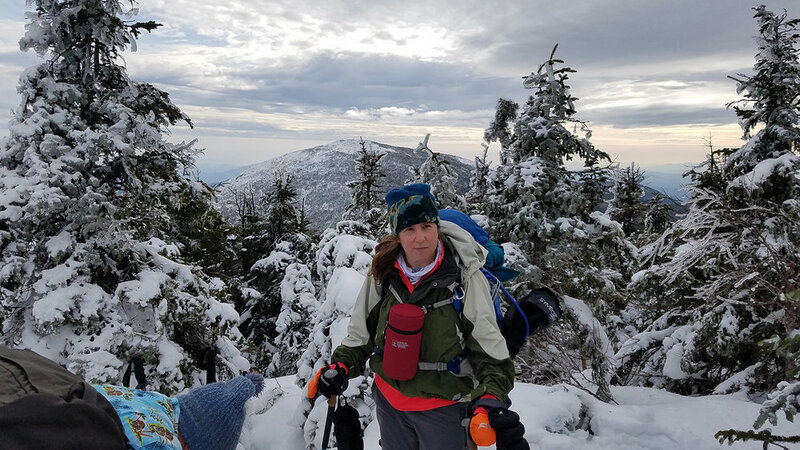 She knew after conquering the Santanonis that she wanted to become a 46’er, saying of herself, “I’m an overachiever.” Jen then began to sign up for many ADK hikes, often with the Saratoga-Glens Falls Chapter, and found that her love of hiking grew steadily. She stated that if she had a free weekend and wasn’t trail running, she’d hike. Luckily, she’d also found a regular group of people that she enjoyed hiking with and learned from. She felt safe with them and trusted their skills, and the pace was good, as they often prescreened hikers before accepting them on the trip. Her first winter hike was in 2015, when she climbed Colvin and Blake in very harsh conditions. She states the hike was “horrible,” and she needed several boosts up in some difficult spots. She found that the hiking served as excellent cross-training for other adventures, such as a 50K ultra trail race in Pennsylvania in fall 2015, and trail marathons such as Nipmuck in western Massachusetts. The long hikes built up her endurance and the elevation changes strengthened her legs. She continued to hike in all seasons, having no specific timetable as to when she’d finish her 46’er. She never thought she’d get hurt hiking, but was a little nervous on a snowy hike up Gray, Skylight and Marcy, as she thought of a Stryder friend who’d been stranded overnight on Marcy one February. Grey, Skylight and Marcy hike, 2018. Her only mishap involved her wedding ring in November 2015. She was hiking with the ADK Albany Chapter and tackling the Seward range, describing the conditions as “frosty mud.” Her fingers often swell while hiking, so she put her wedding ring in her pocket. Her pants didn’t fit well, and kept falling down, exacerbated by “icy mud balls” on the bottom hem. The group finished in the dark, soaked and exhausted, and it wasn’t until the next morning, while sorting through her gear, that she noticed her ring was missing! Emails to the leader and other folks on the trip yielded no results. Over a year later, in 2017, she was getting ready to hike Dial and Nippletop with her usual group, when the leader, Wayne Richter said, “Am I missing anything?” Jen responded, “I’m still missing my wedding band.” That statement prompted Mike Fuller to respond that he had found a wedding ring in the parking lot for the Sewards, and sure enough it was Jen’s! Mike then set up a “wedding ceremony” on a later hike up Street and Nye to return the ring to Jen! Jen’s favorite peak was Haystack due to the beautiful views. Her worst hikes were Colvin and Blake, due to the difficult conditions, and Allen and the Sewards. When she did Allen, there was no bridge yet, and she describes herself as a muddy, wet mess after wading across. What’s next for this accomplished athlete, who finished the 46 at the age of 46? 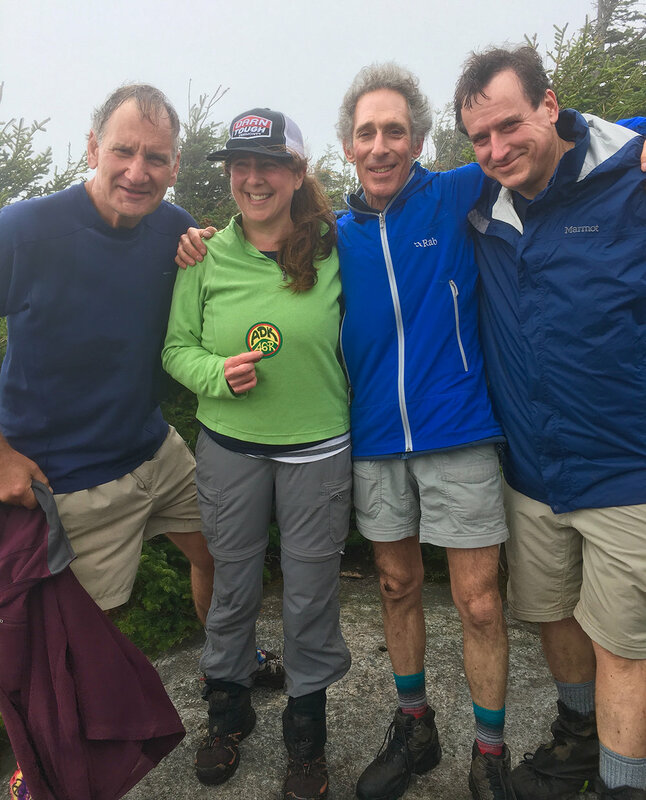 She plans on continuing to hike, for exercise and camaraderie, stating, “There’s never a bad day in the woods.” There is the Adirondack/Catskill Firetower Challenge, finishing the Vermont high peaks, and hiking Mount Washington in New Hampshire. She misses trail running, and looks forward to getting back to that and perhaps competing in the Wakely Dam Ultra, a 55K self-supported run on the Northville-Placid Trail. She’d also like to hike a portion of the Appalachian Trail in each state, and maybe tackle a 14,000-footer out in Colorado. In the near future, she’ll run the After the Leaves Have Fallen trail half-marathon in the Catskills on November 18, and then gear up for snowshoe running this winter. Jen enjoys being part of the “Green Team” at the Saratoga Springs Public Library. She is passionate about the environment and doing what she can locally to tackle climate change and raise awareness of this issue. Her husband and son, Chris and Ivan, have absolutely nothing to do with Jen’s hiking or running but both enjoy nature and animals. Chris supports Jen by letting her take off for a full day every weekend and Ivan enjoys the outdoors by kayaking, hiking and biking. Ivan and Jen have hiked in Singapore and Cambodia together, and the family enjoys family jaunts in the Finger Lakes, and at local parks and preserves. Jen enjoys taking pictures of her adventures, and hopes one day to get an ultralight camera to bring to the mountains. She also loves animals and states she has a “bucket list” of animals she’d like to see, such as a bear, moose, bobcat and pine marten. It’s clear that Jen’s many interests should keep her busy for years to come! Maureen Roberts (maureenroberts@hotmail.com) is a physician living in Saratoga Springs who enjoys running, hiking, biking, skiing, and tennis in her spare time.